Dog agility tunnels are made from heavy duty (610gsm) flame retardant PVC in a variety of colours. The standard diameteris 600mm and they can be made in lengths from 1M to 6M. Three different sizes of spring wire is available which determines the weight of the tunnel, light, medium and heavy duty. These spring wire coils are protected by a thick PVC scuff strip extrusion which is heat bonded on the medium or heavy duty tunnels, or sewn onto the light weight tunnels. Our PVC scuff strip extrusion is available in black as standard or blue as a special. Black poly prop webbing is used and sewn over the wire spring coils if loops are required on the lightweight tunnels. Enclosed end rings at both ends keep the tunnel open. 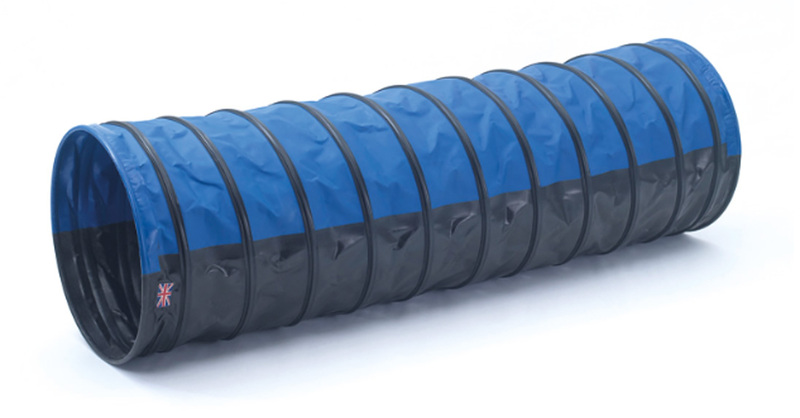 Our agility tunnels concertina down for easy storage and are waterproof and easy clean. We have an extensive colour range of PVC materials available, along with a choice of two colours of non-slip material. Colour combinations of your choice can be used for the medium and heavy weight striped tunnels. As well as the standard PVC material, our lightweight range also has the additional option of a tunnel with a black mesh panel or ones made from a camouflage bag cloth material.